Instant veneers are a relatively new treatment which can transform a patient’s smile in a single visit. They are made from a variety of brands out there, such as Componeers and Edelweiss, which can be used to alter the colour, shape and feel of your teeth in a single visit. The procedure of applying the veneers is incredibly straightforward and minimally invasive, making it the ideal alternative to traditional veneers. At the moment there aren’t many cosmetic dental practices offering the treatment, but that should change as it becomes a more well-known treatment. How Do Instant Veneers Work? While traditional porcelain veneers are custom made for your own unique smile, immediate veneers use prefabricated nano-hybrid composite which have been crafted using laser technology. The pre-defined shape of these veneers is based on various studies which have determined the most aesthetically pleasing shape and colour of teeth. There are multiple shapes and shades of veneer available, so your cosmetic dentist will help match the right style to your own teeth. They can be colour matched to your own teeth using the range of bonding composite shades which are available, meaning they’ll look and feel just like traditional custom-made veneers. 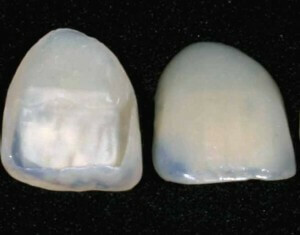 One of the main benefits of porcelain veneers is that the non-porous surface makes them resistant to stains. While this can cause some issues with colour matching your original teeth after a number of years, it keeps your veneers looking fresh. The surface of the veneers are laser sintered, meaning they’ll also be stain resistant and will look polished as long as you have them. Most dentists will use this type or veneer for the upper and lower front teeth, typically treating between two and six teeth at the top or bottom of the mouth. How Much Do Instant Veneers Cost? Immediate veneers are generally much more affordable than porcelain veneers, which opens the treatment up to a whole new range of patients. In general, the treatment will cost between £300-500 per tooth. The cost will vary depending on where you live and how much your own dentist charges for the treatment, but when you compare it to the cost of traditional veneers it’s a far more alternative option. The lower cost is a result of several factors. There is less preparatory work required than traditional veneers, meaning it can often be completed in one sitting. There’s also no lab fees involved as the veneers are pre-made, which saves the dentist time and money and ultimately helps lower the cost of the treatment. Ongoing treatment costs for instant veneers are also much lower than with traditional veneers. With a porcelain veneer, if it chips or breaks the whole veneer would need replaced which involves more prep work, lab fees and a longer fitting. With immediate veneers it can easily be repaired or replaced, as it’s not as fragile as a porcelain veneer. When it comes to speed and price, immediate veneers are the clear winner. The downside is that porcelain veneers tend to look a little better (thanks to being custom made) and have a much better finish than instant. While immediate veneers are stain resistant, they will require an annual polish to keep them looking like new – something traditional veneers don’t need. Both types of veneers will last for years assuming you take proper care of them. Finally, the final look of your immediate veneers is dependent on the artistic skill of your dentist. While traditional veneers are made by a specialised technician, immediate veneers rely on the artistic eye of your dentist. In 99% of cases they will look great so there’s really nothing to worry about, but be aware there’s not the same guarantee as with traditional veneers.